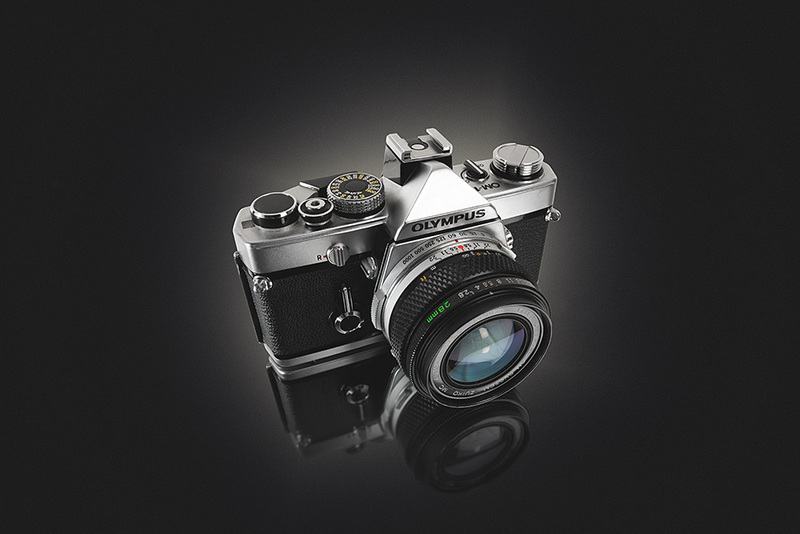 I originally brought the Olympus OM-1 camera for my college course before I progressed onto Reading to study a BA Hons in Professional Photographic Imaging. The cameras been sat on my shelf at home collecting dust so I decided to polish it up and give it the attention it surely deserves after serving me well throughout my first photographic college course. My goal was to capture a crisp reflection so I used a mirror which was reflecting a pure white ceiling. I used two studio flash lights. One was equipped with a soft box and the other was reflecting a stronger light source bounced from a silver lined umbrella. I’m comfortable when I have time to experiment with lighting and often I work with only one light before adding others into the equation because it can be confusing to determine what effect each light is producing? After both lights are set up and producing the desired effect I then add smaller reflectors which can be anything from pieces of paper to photographic boards to bounce light mainly into areas of shadow. The Nikon D810s Live Preview feature really came into play as it allowed me to conveniently position the camera and check light changes even whilst zoomed into an area of the image. This is something that would have been much more difficult if having to use the standard view finder. The most important thing for me is to capture a well exposed sharp image because so much can be changed and enhanced in post processing using techniques available in Photoshop.